Charcot neuroarthropathy is a serious condition that afflicts those with poor sensation, primarily diabetics. In this condition, the poor sensation leads to increased joint and bone pressure in the foot or ankle. When combined with a washing out of bone strength due to the way nerve disease affects blood flow to the bone itself, the increased pressure will lead to a fracturing of the foot. The middle of the arch is the most common part of the foot affected, followed by the ankle. 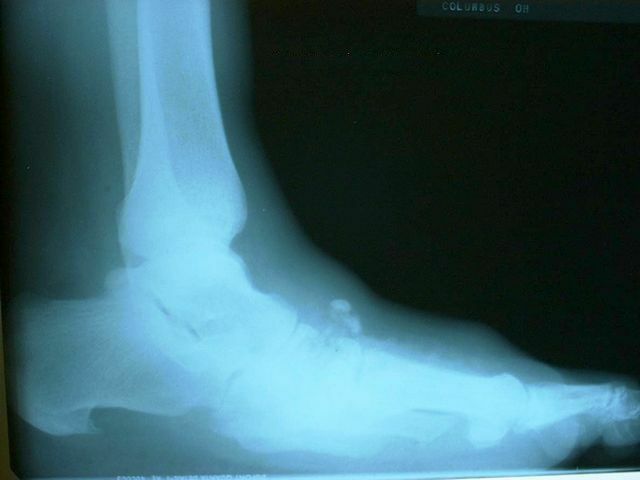 The fractures that occur in Charcot disease are not like normal fractures: the fracturing process lasts for months instead of seconds, and full healing can take six to nine months following the initial fracturing period in nearly every case. This condition is often misdiagnosed in many hospital emergency rooms, as the warmth, redness, and swelling that occurs with this condition resembles a diabetic foot infection, and the massive fracturing of the foot resembles bone infection changes. The initial phase of Charcot neuroarthropathy entails an approximately three month period of persistent bone weakness that shatters, splinters, and moves with even the lightest of pressure on the ground. Once this phase is over, a consolidating phase occurs in which the bones harden up again gradually. The foot is notably less warm, and swelling subsides. This phase can take another three or four months. Finally, a remodeling phase occurs in which some of the deformity created by movement of the fracturing bone is repaired, although most deformity remains. This phase also lasts several months. Treatment and prevention of long term deformity rests solely in early recognition of the disease and prompt removal of the foot from the ground. As the fracturing increases with continued weight bearing on the foot, the bones will move in numerous directions, and the foot will pancake into a rocker shape. The middle of the foot becomes the most prominent part of the foot on the ground, instead of the heel or the ball of the foot. This will eventually lead to severe wound development on the bottom of the foot, and a poorly functional foot in general. By recognizing the disease early, a physician can initiate nonweightbearing in a below-knee cast with the use of crutches or a wheelchair, and prevent the collapse of the foot. Once the fracturing process has ceased, the foot will still need protection in a specialized boot to limit pressure to the fragile bone tissue until it has reached the remodeling phase. At that point, the physician will decide if reconstructive surgery is needed or advised to restore a proper shape to the foot. This surgery is technically difficult and rife with complications, and is often only performed by reconstructive specialists. Most diabetics with Charcot neuroarthropathy are placed in custom shoes and inserts to protect the skin from damage by the newly prominent bone, and are frequently monitored for wounds.